It’s little surprise that many MBAs flock to management consulting careers after graduating. In addition to an average salary of over $140,000 commanded at the big three consulting firms—McKinsey & Company, Boston Consulting Group (BCG), and Bain & Company—students also get the chance to put all their MBA skills to the test, with multiple projects and myriad clients. 24% of the HEC Paris MBA class of 2018 entered consulting after graduating, the most popular career destination for that year’s grads—financial services claimed second (18%), and technology third (17%). 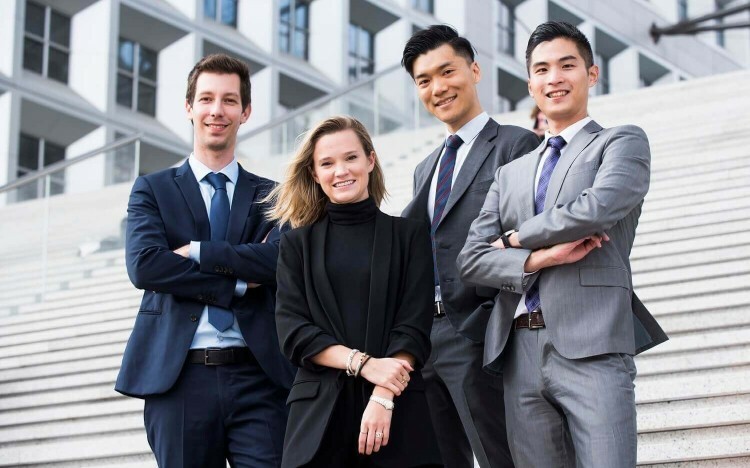 Top MBA recruiters from HEC Paris include the big three, alongside Monitor Deloitte, Accenture, and A.T. Kearney. When it comes to careers, the HEC Paris MBA is seen as a titan of career transformation. 73% of students change sector, 72% change function, and 61% change location—almost 40% complete the fabled ‘triple jump’ and switch all three. Harsha Singhraj is the founder and outgoing president of the HEC Consulting Practice, a student-led professional consulting organization run out HEC Paris. Harsha, who graduated as an engineer in 2008 and had six years’ experience as a strategy consultant and 3 years’ experience in advanced analytics consulting before the MBA, says he set up the consultancy to give students the opportunity for more real-life project work, create tangible business impact, and prepare them for consulting careers. The HEC Consulting Practice works with numerous clients in Europe that need support with their business strategy, digital transformation, or global expansion. They meet with the client to understand the issue at hand, develop a solution approach, and then build a project team with diversely skilled MBA students. This project team works collaboratively with the client to develop and implement a solution that accomplishes the client’s objectives. Harsha (pictured below, right) explains that the project teams also tap into the expertise of HEC Paris’ faculty, working closely with professors in a related field, to benefit from extensive expertise and cutting-edge research. He recalls working with a company in Paris from the electronics industry. The client had a problem leveraging the power of technology in the right way, to be more productive, efficient, and adaptive. That’s something Harsha says many companies seem to struggle with. “Several companies we have spoken with are not getting the kind of organizational impact they seek, despite adopting new technologies,” he asserts. Harsha explains that through his consulting experience he has seen strong synergies at the intersection of business and technology, and this is where he believes innovation and the next wave of growth will come from—creating value for businesses at this intersection is where he would like to be. Benefits for HEC Paris MBAs? Harsha explains that students who work on projects with the HEC Consulting Practice learn a lot from their diversely experienced peers, develop a strong set of soft skills by working closely with clients, and get a strong sense of accomplishment from delivering tangible results to the business community. “I think it’s tremendously impactful,” he says. “Consulting is a great exercise in analytical problem solving, structured thinking, understanding of a clients’ explicit and implicit needs, and extensive collaboration—all of which are highly transferable. Mathieu Viel, the incoming president of the HEC Consulting Practice, says that the diverse set of skills consultants develop is what drew him to the industry. Mathieu (pictured below, right), who had six years’ experience in computer science before the MBA, thinks the Practice is the perfect way to apply your skills during the program. He believes his presidency will be successful as he is able to bring people together in small, successful teams. “We’re looking for projects where we can help companies by leveraging the backgrounds of the people on the MBA,” he says. And his message extends to everyone on the HEC Paris MBA, echoing Harsha’s sentiments. Even if you’re not in consulting, all graduates will at some point have to work on specific projects with tight deadlines. What they need to thrive is a specific type of mindset, he explains.